Many of us, especially as we age, know all too well that reading glasses can be a real hassle. So much so that, according to one survey, about one quarter of Canadians would willingly add an extra 30 minutes to their commute, or gain an extra five pounds, if it meant they could exchange these things to permanently get rid of their reading glasses. The freedom of life without reading glasses may sound like a dream come true – but now, thanks to a relatively new surgery called KAMRA Inlay, this is no longer out of reach. KAMRA Inlay is a laser vision correction procedure that eliminates the dependency of reading glasses altogether. An opaque round micro-disk, smaller than a contact lens, is placed in the cornea in front of the pupil – but you can’t see it. The procedure is safe and highly effective. Without this revolutionary solution, we will all need reading glasses at some point. As we age, our eyes’ lenses lose their elasticity, causing presbyopia. Presbyopia starts to occur in our early-to-mid forties, and over time, our ability to see up-close becomes worse. Eventually, this makes reading glasses a necessity. Life without reading glasses means that you will never find yourself in a situation where you won’t be able to read, use your cell phone, put on makeup, and use the computer… Ponder that for a moment. 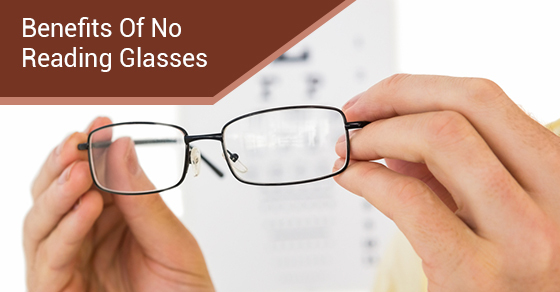 Many people who are dependent on reading glasses know how frustrating it can be. Practically speaking, life becomes much more convenient when you don’t have to rely on your reading glasses in order to see. No more looking for your reading glasses or wondering if you brought them with you. No more frustration when you’ve forgotten, broken or misplaced them. Not everyone likes how they look in reading glasses. Whether you think they age you, or you can’t find a style that you like or that suits you, the good news is that this is not a concern when you don’t need reading glasses. Reading glasses inevitably get lost and broken throughout the year, which can add up over time and be very costly. You can learn more about Kamra Inlay on our website by clicking here. If you are interested in having a Kamra Inlay, consider Skouras Eye and Cosmetic Centre. We are one of the leading comprehensive eye care facilities in Toronto. Contact us today for more information.